Getting the butterflies to fly in formation. Show me a presenter who isn’t just a little anxious when she or he speaks, and I will show you an ineffective speaker. Cicero, Rome’s brilliant orator, admitted, “I turn pale at the outset of every speech and quake in every limb and in my soul.” Winston Churchill got nervous before every speech, and even veteran actress Katharine Hepburn was reported to become “a bundle of nerves” before a live performance. A little anxiety is a good thing when presenting, but a lot of anxiety isn’t. Even over time the fear of speaking publicly doesn’t go away, but great presenters know, as Art Linkletter once said, that you can learn to make the butterflies fly in formation. 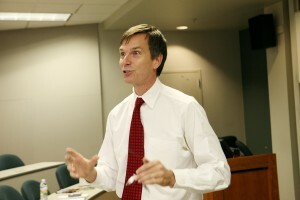 Communications researcher Michael Motley found that most presenters operate under one of two general attitudes – a communications or performance attitude. Speakers with high anxiety almost always have a performance orientation. They view their audience as critics who are judging how they make their presentation. As a result, these presenters become over-focused on their wording and delivery. Presenters with a communications orientation are less concerned with their performance. Instead, they focus on connecting with and communicating to their audiences. When I shift my focus from my performance to my audience’s needs, magic happens. Not only does my anxiety cease, I connect more with the group. Reflecting on what’s happening now. Allow is the message I am now receiving. I am getting it from every side. It’s funny that at the same time I’m studying the Law of Attraction for my next book. Does it really matter what I want? I want to follow God’s will and trust God knows what I need. Allowing means being present; being present means being in the “presence” of God, and God is love. Where am I, right now? My work? It’s on pause. My writing. On pause, too. The marketing of my latest book. Again, pause. It ain’t ready yet. Allow, Randy. Everything has its own season. How do I want to spend my time? Connecting with God, but how do I connect with God? Doing what I did yesterday. Being with nature. Meditating in the sun. Journaling. What do I want to focus on in 2010/2010? Travel, trust, and connection over contribution. I want to put a trip on the calendar every three months. I want to trust in the divine order of things. I want to connect with myself, others, and God. I want to seek God in all I do, and I want to remember: it’s not what I do, it’s being present. From dream to reality. I meet regularly with a wonderful dream interpreter and spiritual guide. 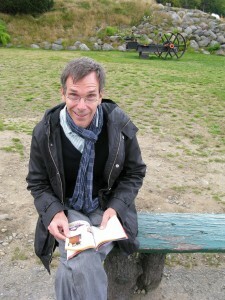 His name is Joseph Dispenza, and he lives in San Miguel, Mexico (We meet by phone). 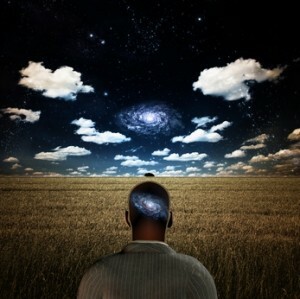 Joseph helps me make what is unconscious, conscious so that I can make choices in my life. At the end of 2006, a shift took place in my dreams regarding my relationship to the feminine and to family dynamics. The feminine characters in my dreams changed, and I kept dreaming that my family home had been sold. A fond farewell. We’re number three on the runway, and within minutes Manhattan appears in my window. There’s Central Park, the Reservoir, and, yes, there’s my apartment. For five months, I was a New Yorker. In truth, I commuted between New York and Asheville, but let’s not split hairs. I did have a New York address. 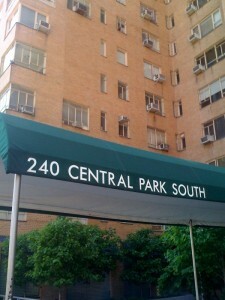 And what an address it was: 240 Central Park South. Pinch me; I still can’t believe my luck. I’ve loved walking in the park, meeting with clients, cocktailing with friends, and navigating new neighborhoods on the subway. I’ve enjoyed spending time alone. I have been able to soak up the energy of this electric city while remaining grounded. Living in New York has always been a dream. In fact, when I turned fifty and looked back on my life one of my few regrets was that I had never lived in Manhattan. Fast forward four years. My friend Roy calls. One of his friends is going to France for five months and wants to sublet his apartment. It is a beautiful one-bedroom with views of Columbus Circle, and the price is right. I jump on the opportunity. The timing couldn’t have been better. I had just broken off a three-year relationship and was reeling. New York offered a lovely diversion, but like most diversions it’s come to an end. That’s okay. I’m ready. I fly back to Asheville knowing I will return, and when I do, it will be with a different perspective. Like running into a former lover, I can be grateful for the time we shared together, secure in the knowledge that another great adventure awaits just around the next corner.